So, you’re reading and researching about PCOS all day. You’re pinning away and reading up on all the blogs, but are you taking action? I’m the queen of reading and not acting, I have a ton of recipe pins on Pinterest- and I have only made about 2 of those recipes. Sound familiar? The goal of this post is to do a PCOS treatment check-up. How active are we in treating our PCOS. I originally made this list for myself, but thought I would share it with the PCOS community. Are you doing everything you can to minimize your PCOS symptoms? Am I? Let’s go through the list below and see how active we are! Found a Gynecologist or Endocrinologist that is educated and actively treats PCOS patients? Addressed all my PCOS symptoms with the Dr. and discussed how to treat each one? Talked to my Dr. about Acupuncture and other PCOS treatment options? Had an ultrasound and blood work ordered by my Dr. to better understand my health and hormone levels? If my hormone levels are off (i.e. estrogen dominant) did my Dr. prescribe progesterone, DHEA or another hormone supplement? Actually take the vitamins and supplements from above on a daily (or as instructed) basis? Cleaned out my diet and removed processed carbs, sugar, and some dairy? Started eating more veggies, seeds, nuts, and fruits? Exercised at least 5 days this week? Decreased the amount of time I spend sitting and being sedentary? Made an effort to get out in the sunshine or out and be social? Used an app to track my menstrual cycle and PCOS symptoms? Well, how did you do? 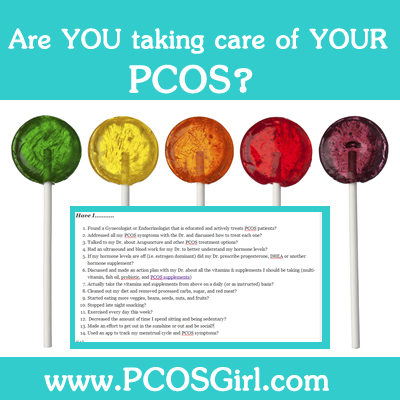 Are you doing all you can to control your PCOS symptoms? I find that I have to look at this checklist often, because sometimes I slack off. My PCOS requires constant monitoring and treatment. If I slack off for just a weekend I find it incredibly hard to get back on track. I feel bloated, exhausted, depressed, and craving sugar like crazy. Is there anything else I should add to this list? Let me know! This entry was posted in Coping with PCOS, PCOS, PCOS Reflections. Readers may want to consider sharing this with other women who may recognize signs and symptoms in themselves and who may be able to treat/manage now! It may be embarrassing or be a sore subject for you, but it doesn’t have to be and you can help someone else. So true. I didn’t even think of that, but now I have a lost of women that are getting a link in their inbox today. I’m so grateful for all the PCOS support that is out there, including this and good people who share it!